ETX Capital review - Scam? Mobile? Demo account? Read more. ETX Capital Review- Demo account? Scam? Safe? App? ETX Capital is a leading forex, binary options, and CFD broker operated by Monecor, a British company with headquarters in London. Moneco was first launched in 1965, making it one of the oldest companies in the industry and definitely the oldest broker that we recommend. However, ETX Capital as a broker for assets online wasn’t launched until 2002. ETX Capital offers thousands of financial instruments on most of the world’s markets and they are very serious about the brand they represent. One of our favorite aspects of ETX Capital is its extensive and thorough educational program. 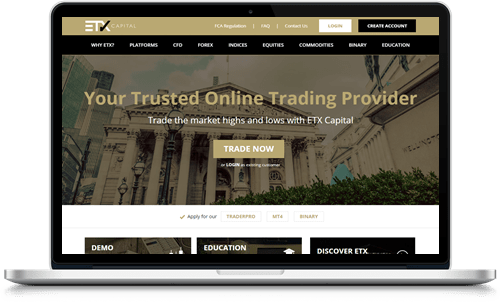 Learn more about ETX Capital in our detailed review about the forex broker. ETX Capital has more experience in the investment industry than most brokers. The company that operates the online broker has been around since the 1960s which gives them plenty of advantages over other brokers. However, it also creates some disadvantages for them. For example, some of ETX Capital's tools feel a bit outdated and their website is not as modern and sleek as many other brokers. We would also like to see a live chat feature added. All in all, ETX Capital is a good broker with plenty of options for traders in all stages of life with every level of experience. Generally speaking, ETX Capital is a good option for anyone looking to trade currencies, binary options, and CFDs. Is ETX Capital a Scam or are they legit? Let us start by answering the most important question: Is ETX Capital a scam? No, ETX Capital is a reliable broker that has provided investment opportunities for tens of thousands of customers over the past 15 years. The broker has developed in a way that nothing feels excessive. Everything from their website to their platforms and mobile tools are well-designed and they all fill a very important purpose. In fact, ETX represents one of the stronger brands on the market. We are certain that you have nothing to worry about when using ETX Capital but how good are their services? What assets and platforms do they offer? We will talk more about that on this page. Let us give you a rundown of the different platforms and tools that ETX Capital works with so that you can get a better understanding of what you can expect from this broker. ETX TraderPro is ETX’s proprietary trading platform that was developed by the brokers own developers, meaning it is exclusive for ETX Capital customers. The platform is neatly designed and practical to use. TraderPro is compatible with CFDs. Note that binary options can’t be traded with this platform. ETX Binary is ETX Capital’s interactive platform for binary options trading and this platform has also been developed in-house. Compared to other binary options platforms on the market, this platform is nicely designed. However, we have heard that many customers think it’s a bit too hard to use. Most people seem to prefer other platforms for their binary options trading. You can trade binary options with closing times of 60 seconds up to 24 hours with ETX Binary. In order to stay relevant in today’s industry, a broker needs to offer a solid Trading App. The market is still quite new so the standard of trading apps differs a bit. Although, we are expecting to see major advances in that field in the coming years. Fortunately, when it comes to ETX Capital they offer everything you could need for mobile trading. All three of the above-mentioned platforms are mobile compatible which means that you can bring your trades with you wherever you go. ETX TradePro comes in a mobile version for iPhone, iPads, and all Android products. Unlike other apps, this one is unlimited meaning you get access to all the regular features directly on your smartphone or tablet. It is a solid trading app and a complete copy of the desktop version. MetaTrader 4 is also available for iOS and Android, however, this app is limited. You can use MetaTrader mobile to keep an eye on ongoing trades, open simple positions, and do easy analytic work. ETX Binary is available in a mobile version for Android, iPad, and iPhone. With this app, you can trade binary options on the go which is perfect for all of us that don’t have time to spend all day in front of a computer or people who have long commutes to work. By opening an account with ETX Capital, you gain access to three platforms and possibilities to trade on the world’s most lucrative markets. Also, if you’ve never traded before or want to develop strategies, you can open an ETX Capital demo account. If you would like to test one of ETX Capital’s platforms before you deposit your own money you can open an ETX Capital demo account. With a demo account, you can trade on the available markets using virtual money, hence avoiding all risks. Your profits are not real money either so the only thing you gain is experience. A demo account is, therefore, best used in combination with a regular trading account. ETX Capital demo accounts available for all three platforms. To open a trading account with ETX Capital, you first need to know what platform you want to use and then you can open an account on that specific platform. If you want to open one account on all platforms you will have to contact customer service so that they can help you get started. Note that you don’t automatically get access to all three platforms, and you have to contact ETX Capital customer service first. if you are unsure then have a look at the etx capital mt4 demo account first. Since ETX Capital offers access to three different markets – forex, binary options, and CFD – they also offer a large selection of assets to trade with. In fact, their selection consists of thousands of assets on several markets and you can read more about all of them below. Forex Trading is one of ETX Capital’s main focuses. According to their website, they offer the “tightest spreads” and the most competitive prices but that is hard to confirm. What we do know is that you can trade with big currencies such as USD, EUR, and GBP both as currency pairs and as binary options and CFDs. Binary Options is a newer part of ETX Capital’s selection of assets. With a binary options trading account, you can speculate on the value of underlying assets in both upward and downward trends. In our opinion, binary options offer some of the most exciting trading opportunities today. CFDs, or Contract for Differences, is a type of investment that gives you access to several markets through ETX Capital’s platforms. For example, you can buy CFDs as stocks, indices, and commodities on both MetaTrader 4 and ETX TraderPro. A Commodity is a financial asset that you buy as CFD with ETX Capital. You can invest your money both in the long-term and short-term with assets such as gold, silver, sugar, coffee, etc. Stocks can be bought in most of the world’s companies. You also have the option of not buying the actual stock itself but instead speculating on its price with a CFD or an option. Index is a collection of stocks that are traded as a unity. You can use all of ETC Capital’s platforms to trade indices. Spread betting is a speculative form of investing that shares a lot of characteristics with CFD trading. It’s easy to learn, offers good potential payouts, and is a favorite in the UK since it is tax-free. ETX Capital is very clear with the fact that they are fully regulated and trustworthy. At the top of their website, you will find a direct link to all of their license. Personally, we appreciate that it is so easy to find all this information. Since Monecor is a British company located in England, they have their main license from FCA (reference number 124721), who also regulates them. This license gives them the right to offer financial services to most of Europe. Bank Transfer – From your bank to your trading account (either from your local bank or over the internet). Credit or debit card – All the major cards are accepted including Visa, Mastercard, and Diners Club (AMEX is not supported). Neteller & Skrill – Two of the leading online payment services can be used to fund your trading account. Sofort – A semi-online payment method. Note that ETX Capital also offers some local payment methods that are not available to all traders. You have to log in to your own account to double check what methods you can use. The ETX Capital customer service has been awarded multiple prizes for their professionalism and dedication. Unfortunately, ETX Capital does not provide a live chat. ETX Capital also has an extensive FAQ on its website with answers to the most common questions related to accounts, transactions, and trading in general. I deposited my money on my etx account on the 24 of December 2017 and it doesnt appear on my account and no one seems to know where it is , l have been calling all these days and the response I get is that they still checking . And nothing is happening. Hi, we are going to follow up with ETX Capital and try to get them to reply to you here in the comment section. Bare with us.